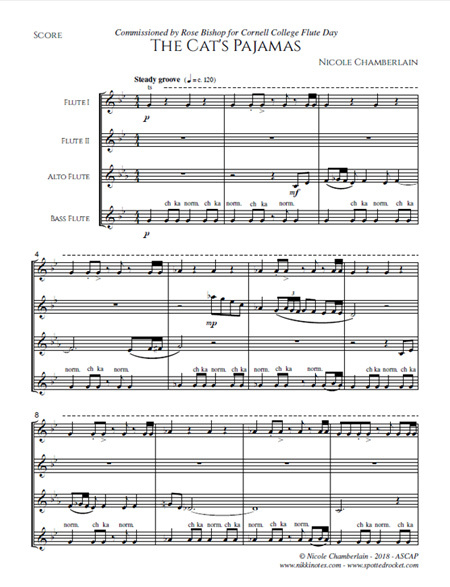 The Cat's Pajamas was commissioned by flutist Rose Bishop for Cornell College's Flute Day. Bishop and Chamberlain met when reading Chamberlain's first flute quartet Tamar while Bishop was studying at Georgia State University in Atlanta. The pair have kept in touch over the years and finally found the opportunity to collaborate together with this commission. The 1960's jazz music influenced the style of this piece, and seemed fitting to title the piece after the beatnik slang which means really cool - never mind that Bishop is an avid cat lover.